I have been on the lookout for the perfect low budget headboard for awhile now. 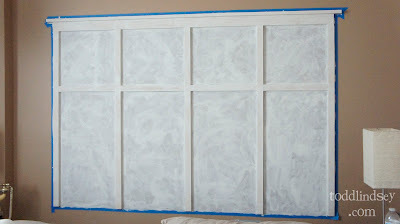 Originally, I had found some images on Pinterest of headboards made of a collection of frames, sort of like a gallery wall. I really loved the look and did try it out. Unfortunately, it didn't hold up. I used Command strips to hang the photos but they still fell down. A gorgeous look but not very practical for something that gets daily use. 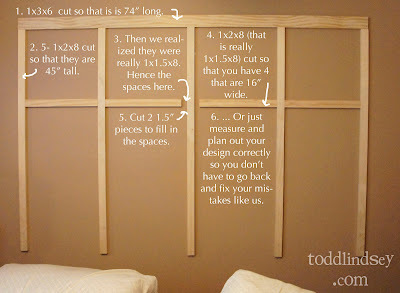 This could totally be done as a one weekend project. It took us a bit longer because we weren't solely focused on it and because we were doggie sitting. And the other plus? It was less than $25!!! We had a lot of the supplies and only had to buy the lumber. 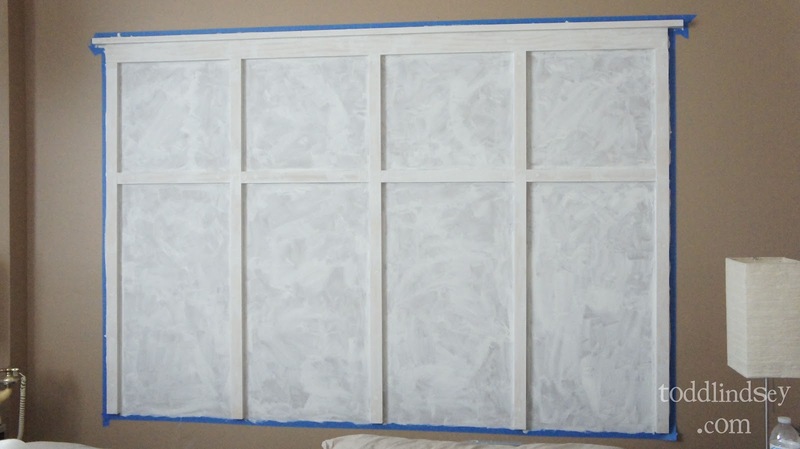 Even if you did have to buy the paint, it would still end up to be much cheaper than buying a custom headboard at a store. Figure out your plan. I had mine all drawn out on a napkin before I decided that that probably wasn't such a great idea. I didn't want it to disintegrate in the middle of the project so I redrew it on a piece of paper. 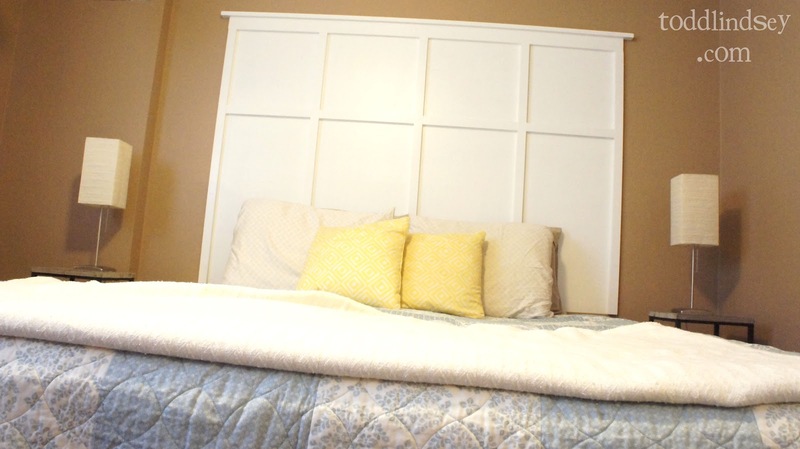 I based it on our king sized bed. The sign and the receipt both said my wood was 1x2x8 however we discovered (mid project, of course) that the wood was in fact 1x1.5x8. So much for planning it all out. Silly me thinking a sign that said 1x2x8 really meant that the wood was indeed 1x2x8. Lesson for you: Make sure you measure your wood and do NOT rely on signs! This resulted in some adjusting later on. 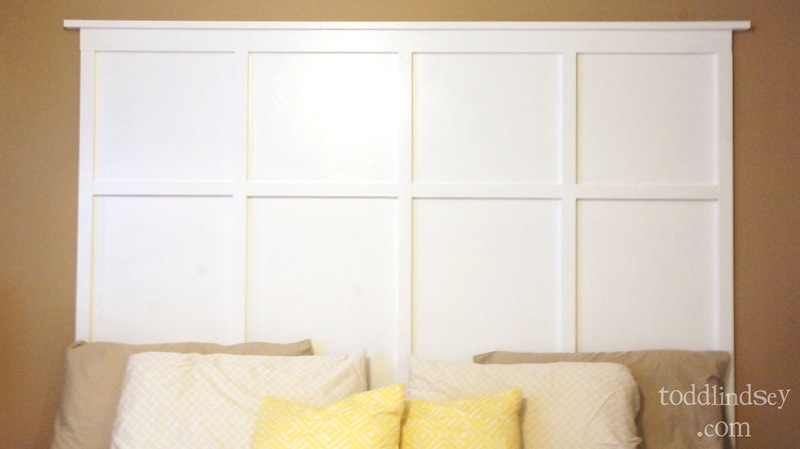 Mark out the wall you want your headboard on with a pencil. 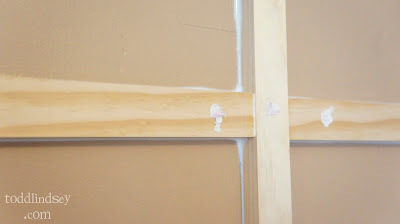 You can also mark where the studs are if you want to nail your wood pieces into them. This is optional though. 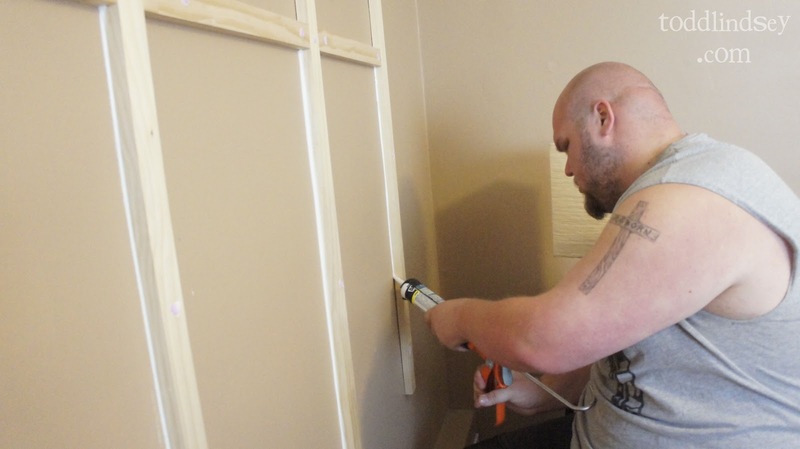 Attach your pieces to the wall by applying a few dabs of Liquid Nails on the back. 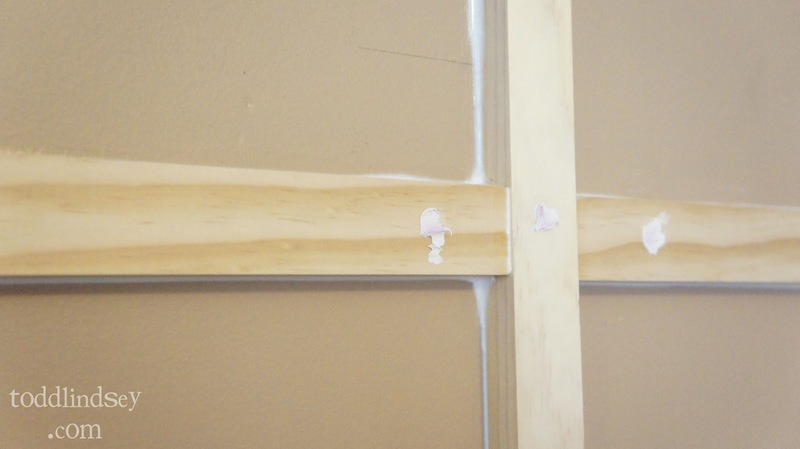 Nail the lumber pieces in the wall with trim nails. If you want, you can put nails in the studs. 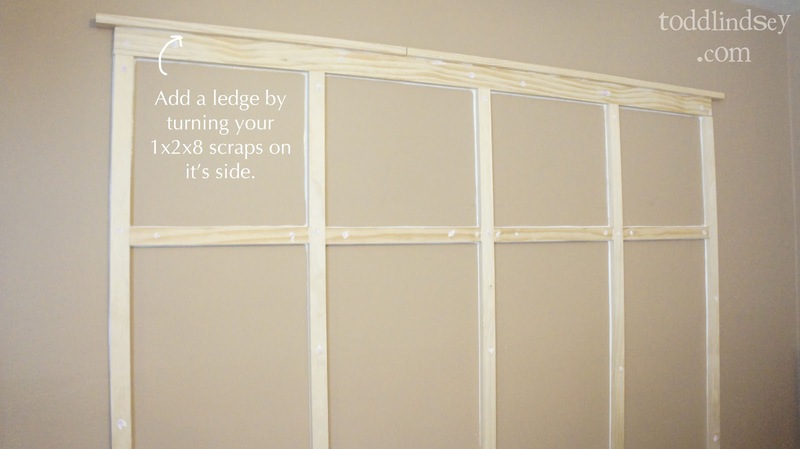 Use your leftover 1x2x8s (or 1x1.5x8s) and flip them sideways. 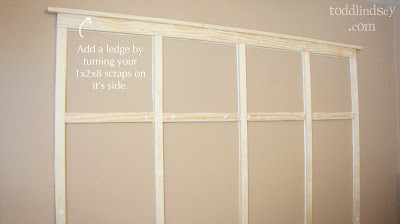 Use some Liquid Nails to attach to the top as a ledge. Caulk all edges that are not flush with the wall and spackle your nail holes. Wait. 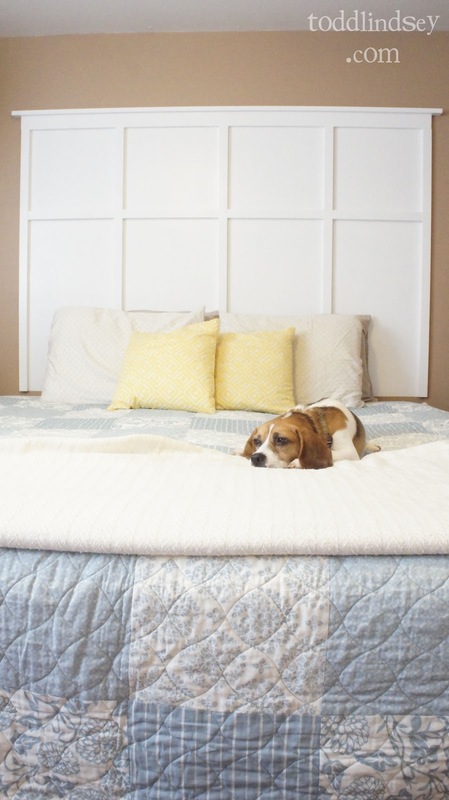 Sit around or find something else to do until your caulk and spackle dries. Tape off your headboard and prime. I used Zinnser brand primer. Toxic but effective. Paint with desired color. I used a bright, clean white in a semi-gloss finish. It took three coats to get the coverage I wanted. Lay down and relax. Enjoy your handiwork! Awesome job!! Looks so great! Gorgeous - this is completely being added to my Headboard idea pins!!! Stopping by from the NY Melrose hop. Oh my goodness this turned out so great! Love how crisp & clean the white is with the rest of the room. Well done!! 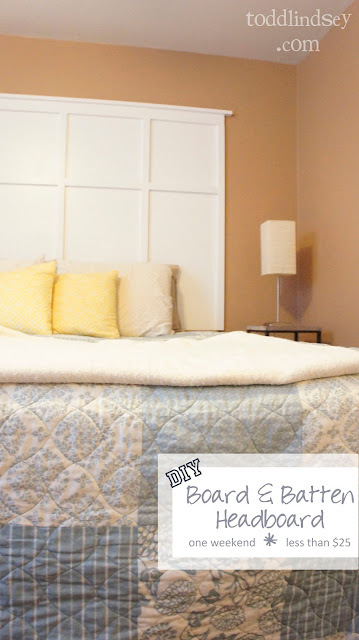 What a fun project - it looks great! 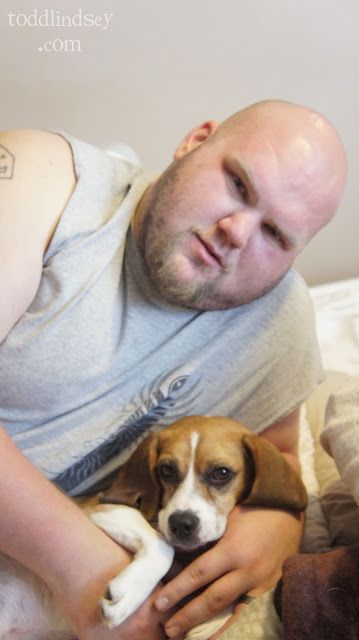 It looks like you have a beagle? So cute. I have one too. Unfortunately, she got the big genes in the litter and she's probably twice the size of yours! That is really beautiful! I'm sure it would cost a ton to buy it, I can't believe you were able to make it yourself. Thanks for linking! Thanks so much for sharing with us at Someday Crafts! 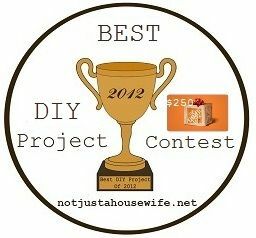 I will be featuring your project tomorrow on our blog. 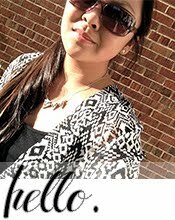 Please stop back in and grab a Featured at Someday Crafts button for your blog. What a great idea! Your home is beautiful! !